He built a fringe political organization likened to a cult and ran for president eight times, once while in prison for mail fraud. 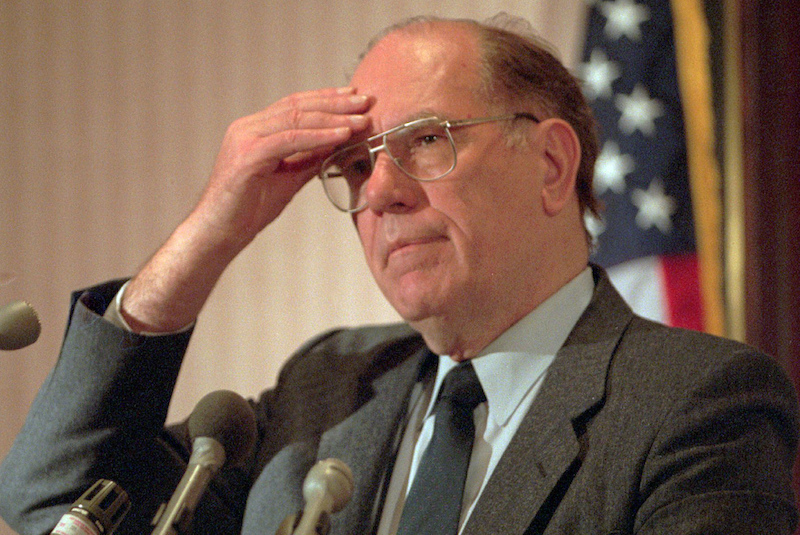 Often described as an extremist crank and fringe figure, Lyndon H. LaRouche Jr. cut a shadowy and alarming path through American politics for a half-century. He built a political organization often likened to a cult and ran for president eight times, once while in prison for mail fraud. In recent decades, he operated from a heavily guarded compound near Leesburg, Virginia. LaRouche, who built a worldwide following based on conspiracy theories, economic doom, anti-Semitism, homophobia and racism, died Feb. 12. He was 96. LaRouche drew headlines for his more outrageous claims: that England’s Queen Elizabeth II was a drug trafficker and that the International Monetary Fund created and spread the AIDS virus. LaRouchians, as the group was known, never numbered more than 3,000, according to some estimates, but were a vocal, sometimes disturbing presence on the American political landscape. They heckled, harassed and occasionally threatened opponents. “They built a nationwide election machine that fielded thousands of candidates in Democratic primaries in the mid-1980s, frequently picking up 20 percent or more of the vote and winning dozens of nominations for public office,” he wrote. His operation suffered a massive blow in 1988 after he was convicted of income-tax evasion, mail fraud and a scheme that took money without permission from the credit-card accounts of elderly donors. He served five years of a 15-year sentence and ran his 1992 campaign from a federal prison. Lyndon Hermyle LaRouche Jr. was born in Rochester, New Hampshire, on Sept. 8, 1922, and grew up in Lynn, Massachusetts. His father, an executive at a shoe-manufacturing firm, also edited an anti-communist newspaper. Bullied at school, young Lyndon was forbidden to fight back because of the family’s pacifist Quaker beliefs. He attended Northeastern University in Boston but left, according to his memoir, “The Power of Reason,” when teachers refused to indulge in his questioning of accepted truths in geometry class. He was a conscientious objector at the outbreak of World War II and served as an Army medic in Burma, according to followers quoted in 1985 Washington Post profile. LaRouche associates have said their leader was drawn to revolutionary politics after the war. Among socialists, he attracted negative attention for discursive essays he wrote in florid, stream-of-consciousness prose and was dismissed as a crank. He split from one leftist organization after another and formed the National Caucus of Labor Committees. Initially low-key, his group reportedly became radicalized after LaRouche’s common-law wife left him in 1972 to marry one of his followers. According to The Post, LaRouche began ordering his members to prepare for battle through karate and guerrilla training. One of LaRouche’s cellmates in Minnesota was disgraced televangelist Jim Bakker. In his autobiography, Bakker wrote that LaRouche was good-humored much of the time and impervious to the taunts of other inmates. He also was convinced their cell was bugged.